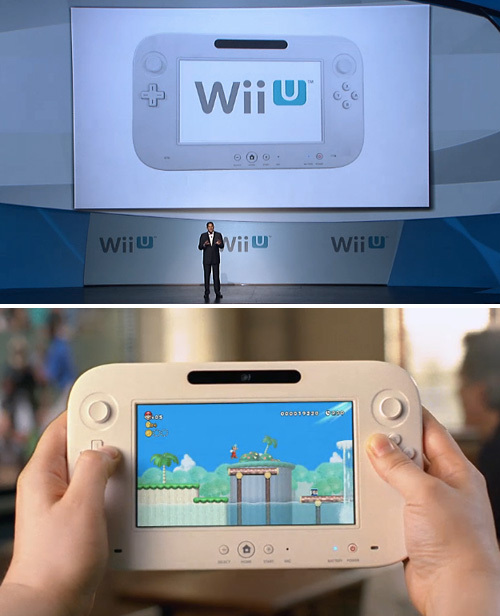 Nintendo Reveals WiiU, Only Shows Off Its New Touchscreen Controller (Updated) | OhGizmo! So far E3 hasn’t brought much in terms of major news or announcements. But this morning Nintendo provided a bit of a sneak peek at the upcoming successor to the Wii, which unfortunately isn’t going to be available until 2012. The WiiU is its official moniker, and while Nintendo revealed virtually nothing about the console itself in terms of tech specs or even how it will look, they did show a few samples of its graphic capabilities, which at this point are considerably more advanced than the Wii. But it’s not a hard act to follow in that regard. They did however spill the beans on the WiiU’s new controller, which confirms rumors over the past month that it will include a touchscreen display. It does indeed, a 6.2-inch one to be exact, that can mirror gameplay seen on a TV screen, or show independent gaming elements like items screens, maps, scopes and I’m sure a million other ideas no one’s thought of yet. As a controller it’s got a couple of analog control sticks, a 4-way directional pad mirrored with individual A, B, X & Y buttons on the other side, as well as shoulder buttons and z-trigger buttons on the back. It also sports a front facing camera, and other modern gaming features like rumble and gyroscope-based motion controls. When the TV is being used the WiiU controller will still let you play your games, serving as a handheld alternate display as images from the new console are wirelessly streamed to it. (Presumably without a hint of lag.) While it’s not designed to be a portable gaming system like the 3DS, it apparently can still be used like one when in proximity of the console. And even though the official reveal of everything the WiiU has to offer is still a while away, Nintendo will have a series of technology demos at their E3 booth showing unique ways the new controller can be used. 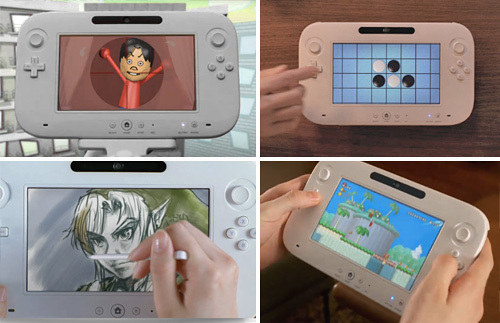 Update: It looks like Nintendo has provided a few images of what the WiiU console actually looks like. As well as a few tech spec snippets including the fact it will use a custom 45nm IBM processor, has full 1080P support, can access and store content on external storage devices like a hard drive connected to one of four USB ports and will still use optical discs as a game medium. And of course it’s fully backwards compatible with the original Wii, including use of the motion controllers.